This is a post about combining two steps I've blogged recently. Combined they form a technique that can be used with approval workflows to provide a point in time snapshot. I have been building up a library of really useful Flow blocks. Because you can combine them in pretty interesting and important ways. Save a post-approval list item as part of the record keeping process. Use the new result as the Object to continue. This is how everything looks at the end. This doesn't show the details of each step, but is intended to show you how all the pieces look together at the end. I use this as a Nested Flow as part of our Approval workflows to create PDF snapshots of list items. If you want to use SharePoint's Records Management features - you can declare the PDF as records. You will need a simple AzureFunction to do this. You can use For Each as well, if you are using that - then it's better to use Array Variable, and use the Append action. Another crazy idea while travelling on the train home. This one is so simple, in hindsight, I reckon others will come up with this soon. So I'm writing this first. When I was testing the idea on Friday night, I did a livestream hack and that's on Mixer https://mixer.com/Sousily?vod=12283142 - skip to 13:50 that's when we started the hack. And by the end of this blog post - you can push change back into Flow, you have both Backup AND Restore. A big thank you to Sohail Merchant who told me how to get to JSON Editor via the Preview Panel in SharePoint. I was going to write this whole post about using OneDrive for Business. 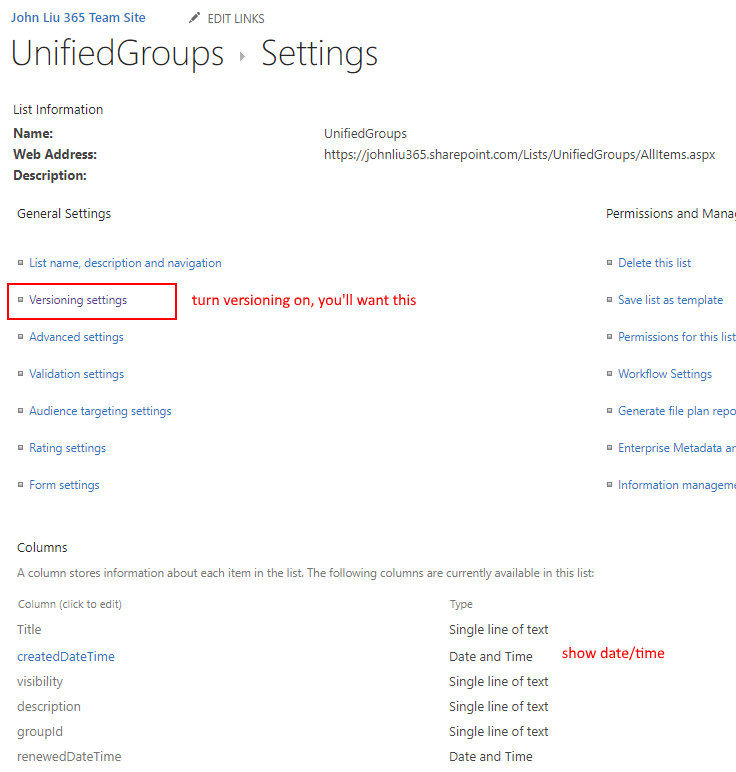 In May 2015 - I put up a SharePoint User Voice request to allow .json as an allowed file type in SharePoint and OneDrive. This was done and rolled out in October 2017. 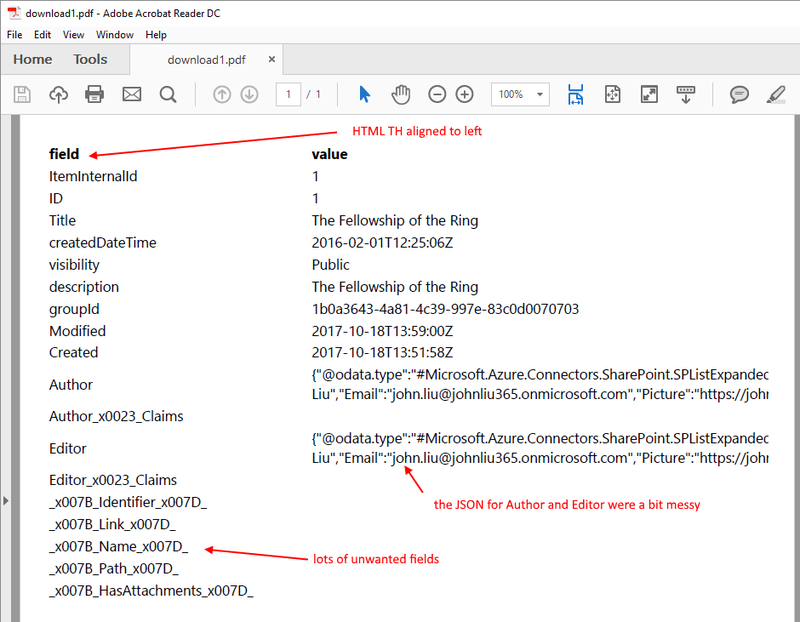 But the SP/OD team went beyond and included a JSON editor. Which is why we have this kind of amazing integration between products. Make sure you check On Change - Upload. I suggest you use a different account to write Flows to SharePoint. Then On Change - if the Modified By is this Flow account, skip the upload. Otherwise the schedule trigger will download the Flows, and trigger the File change which will upload the Flows and tomorrow the schedule trigger will re-download the Flows. It would be quite silly. Simple ideas are the best ideas. You need to build one of this. Any time, you think, hey I have a tool that can update itself. Then you realize Flow is Self-Hosting. And you can use it to improve itself. So I immediately hacked parallel settings into the first Flow above. 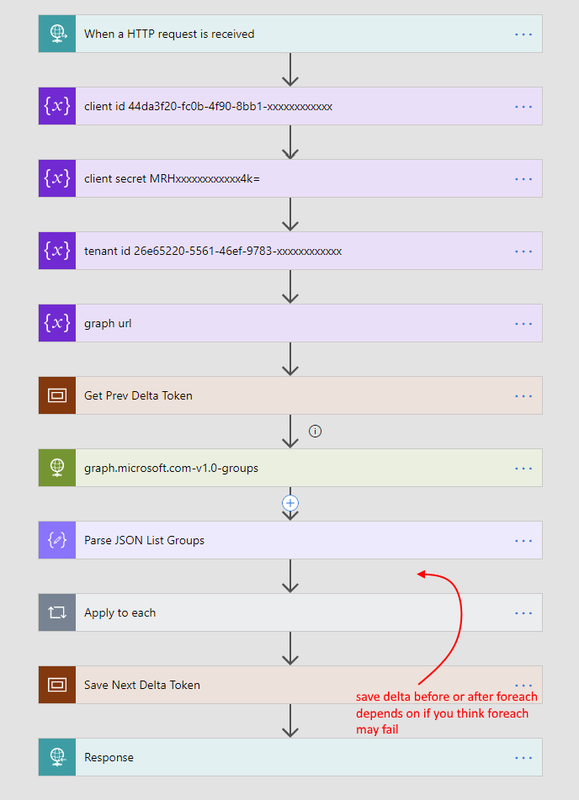 Scanning changed Flows is now faster. (slightly, since the for-each is in parallel). 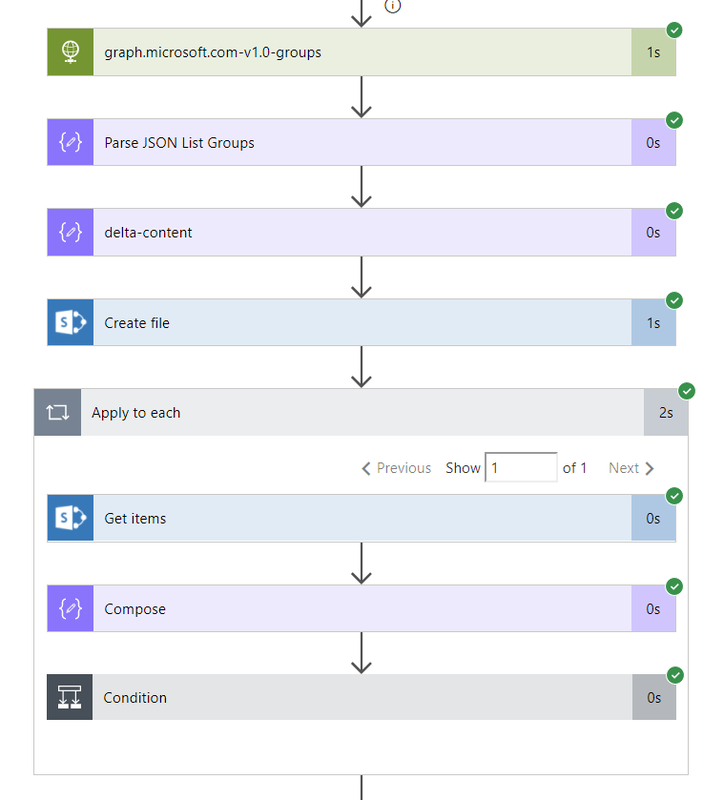 I can't think of a way to do "ForEach Property Of JSON" in MicrosoftFlow or LogicApps - so I came up with this method that involves XPath. 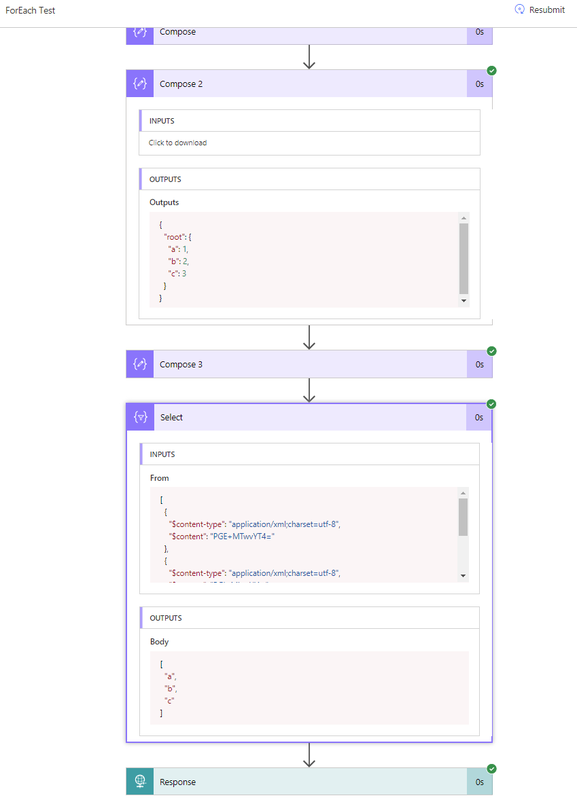 This next XPath splits each XML element under /root/ into a Nodeset (array of XML elements). I'm sure there'll be a better way one day. But for now this will get me through. I need this to be able to read nested JSON structures as part of my bigger plan.